You can start running through your checklist for fire safety in hotel before you even get to your room. When you make a hotel reservation, you may want to request a room on one of the hotel's lower floors. Having a hotel room in a high tower may give you a great view of the city you are staying in or the ocean, but it isn't the best choice from a safety standpoint. If a fire breaks out in your hotel, you may be faced with having to walk down several flights of stairs before you can get out of the building. Fire crews will have a much easier time getting to you if you are trapped in your room if you are on the first few floors of the hotel. Check the floor where you room is located. Can you see a minimum of two exits? Are the exit signs illuminated so that they can be easily read? Is there a fire extinguisher on the floor? You will also want to check to see if there is a fire alarm on the floor. Doors leading to the outside should be able to be opened with a single action. Once you get to your room, check to see if it is equipped with a smoke detector. You also want to make sure that it has a sprinkler system in place. A fire evacuation plan should be posted in your room. You will probably find it attached to the inside of the door. If you don't see one when you enter the room, contact the front desk to ask for one. Even if you have gone through your checklist for fire safety in hotel, that doesn't mean that you have eliminate the risk of fire. What you should do will depend on where the fire is. If a fire starts in your room, your first responsibility is to get out safely. Leave the room right away and close the door behind you. Pull the fire alarm in the hallway, and let the front desk staff know about the situation. In a situation where the fire is outside your room, you need to determine whether it is safe to leave or not. Before you try to open the door to your room, touch it with the back of your hand. If it feels cool to the touch, open it slowly to check the hallway for smoke and flames. Once you have determined that you can get out of your room safely, do so but remember to take your room key with you. You may need to get back inside if you can't make it to the exit. Keep in mind that the purest air is close to the floor. If the hallway is smokey, crawl on your hands and knees until you get to the closest exit. If you check the door and it's warm to the touch, the safest choice is to stay in your room. Take some wet towels or sheets and place them at the bottom of the door to seal it. Contact the fire department to tell them you are still in your room and wait for help to arrive. 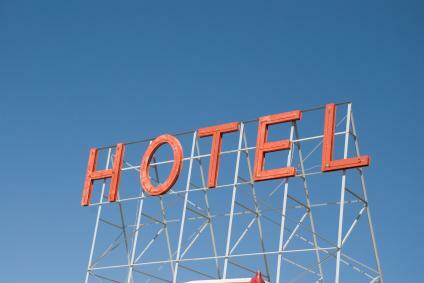 Check out your hotel on arrival to make sure that you feel safe and secure before getting comfortable in your room. That way, your visit will be much more enjoyable.